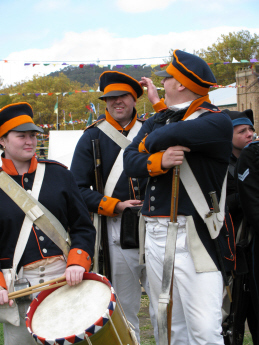 The 7th Dutch Militia 1815 was formed in 2008 by members of the Living History Resource Group who were interested in the contribution of the army of the United Provinces during the 100 days campaign. It was felt by members that the Dutch contribution had been often overlooked and underplayed in the telling of the campaign in Military History circles and especially from an Anglo centric view of the Hundred Days campaign. Another guiding force was the interest shared for some of us as second and third generation Australians of Netherlands descent to explore an aspect of our collective heritage. To foster an interest in the contribution and pivotal roles played by Dutch troops at the Battle of Quatre Bras and Waterloo and in so doing dispel some of the myths of the inadequacy of Dutch and Belgian Troops in the campaign. The 7th Dutch Militia were one of five battalions in Luitenant Kolonel Willem Frederik Graaf (Count) Van Bijlands (pictured above) 1st brigade of the Second Division commanded by Lt Gen. Baron Henri-Georges Perponcher-Sedinitzky. One of the most exciting parts of our research has been finding out that the first three units in Bylands Brigade have already been recreated whilst the 8th has been heavily researched. The 7th Dutch Militia was commanded by Lt Col Singendonck and entered the hundred days campaign with a total of 22 officers and 622 other ranks giving a total of 644.